Triple and Quadruple occupancy rates available. A note on this years tour. We have made a few changes to the itinerary for 2019 to allow us more time in the Zion area. We are also including the night before the tour starts in the cost of the tour making this a 5 night, 5 day tour. The Mighty Five is fast becoming one of our most popular tours. Five of the countries most beautiful national parks all located in a small geographical area. And yet each one is so different from its neighbors. Born of the Colorado plateau uplift these parks offer some of the unique landscape and rock formations you will find anywhere in the world. In addition to the National Parks, we also visit two of our states most beautiful and unusual parks. Zion NP, Bryce Canyon NP, Capitol Reef NP, Arches NP, Canyonlands NP, Escalante-Grand Staircase National Monument, Goblin Valley State Park, Deadhorse Point State Park, and Salt Lake Cities Mormon Temple Square (Temple Square has more visitors every year than most of the national parks in Utah, combined). Lodging is in 3 star or better hotels wherever possible. Generally, our groups are small with eight to ten passengers. We use a comfortable modified van for larger groups and a suburban or similar for groups of 4 or less. We begin the tour in Las Vegas and end in Salt Lake City. Our guides are the best in the area. They usually are natives of Southern Utah and have a lifetime of stories and insights to draw upon. There is no substitute for experience. 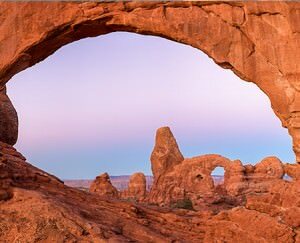 They provide a comprehensive overview of the history, geology, plant life, and culture of the West. 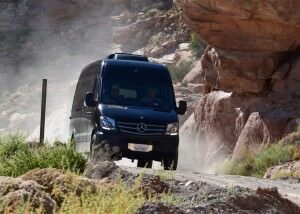 After you arrive in Las Vegas and collect your luggage you will connect with a shuttle which will then transport you to St George, UT for your overnight stay. Get settled in, enjoy the beauty of the city of St George. We will be getting started first thing in the morning. We begin our Mighty 5 tour with an 8:00 AM departure from your hotel in St George UT. 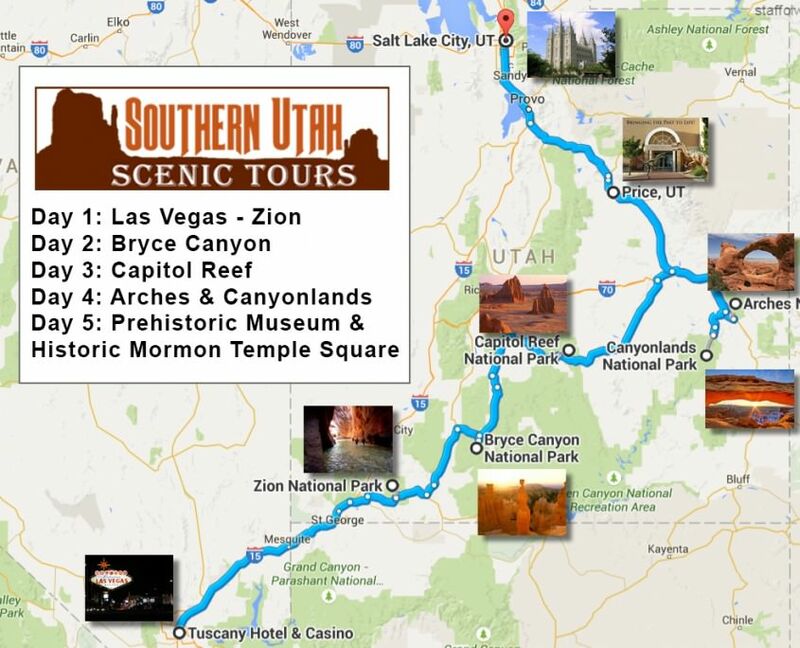 Our immediate destination is Zion National Park, a short, 50 min drive away. Zion National Park is one of nature’s greatest wonders. Gigantic red and white rock monoliths tower around you like a skyscraper city of stone, concealing pockets of abundant flora and fauna. See the Great White Throne, Angel’s Landing, the Court of the Patriarchs, and the Narrows where the Virgin River has carved out a narrow canyon with 2,000-foot cliffs on each side. 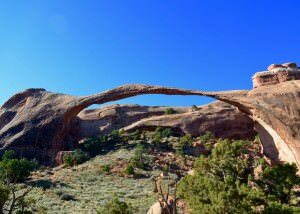 There are some great trails to walk, from moderate to difficult as we explore some of the key sites in Utah’s most visited national park. 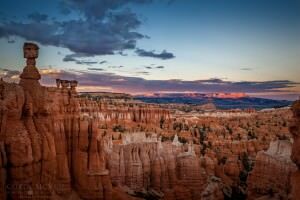 Bryce Canyon is a short, two-hour drive away. There is no other place on earth like Bryce Canyon. Made famous for its pink and white uniquely shaped hoodoos, Bryce Canyon is a great place to experience. There are a couple of hiking/walking options to enjoy as well as fantastic viewpoints to discover. 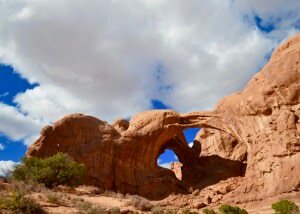 Later that afternoon, we drive over famous Highway 12, truly one of America’s most scenic highways, and into parts of the Grand Staircase Escalante National Monument. No other place in the lower 48 is as remote and undiscovered as in this part of Utah. See why “Car and Driver” magazine and others have called Highway 12 one of America’s most beautiful drives. Capital Reef is Utah’s least visited national park so don’t expect large crowds of people. We have a morning scenic drive in Capital Reef’s Water Pocket fold. We visit an ancient Petroglyph panel. In the fall, seasonal fruit can be picked in the old pioneer orchards, and small pies and ice cream are available in the nearby Gifford House Museum year-round. In the afternoon, we head for Utah’s most unusual State Park, Goblin Valley. The rock formations here are unique and do have an unearthly and strange look about them. Then, we drive to the John Wesley Powell History Museum in Green River, Utah. John W. Powell had a significant influence on this part of Utah. He and his group were the first to successfully float down the Green and then the Colorado River through the Grand Canyon in 1869. Powell named a number of the rivers and mountain ranges found in the area. 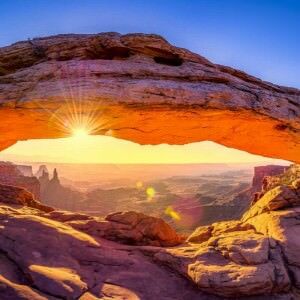 After breakfast, we take in Utah’s most beautiful State Park, Dead Horse Point. Here, a fantastic view of the canyons of the Colorado River is offered from a towering mesa, hundreds of feet above the canyon.